Halifax full back Miles Greenwood is out to end his second spell with the club on a high after confirming he will be moving elsewhere in 2017. Greenwood, who returned to Richard Marshall’s matchday 17 after two months on the sidelines in Sunday’s 24-22 loss to Dewsbury, first played at the Shay during Matt Calland’s reign as head coach before a three season absence at Oldham and Batley. But with Marshall expected to overhaul his playing staff this winter, the Oldham-based number one will not be among those retained. “I’m not here next year, that’s a definite,” said Greenwood, who missed virtually all of the club’s successful 2015 season after breaking his leg in two places. “That puts extra importance on the next few games for me because it’s the last time I’ll get to play with a fantastic group of players. “I’ve not committed anywhere else yet, but I’ll keep going. “Having that year out has rested the mind and the body and I feel I still like I’ve got a lot to offer. “Coming back has not gone as I’d hoped with the leg break and everything, but these things happen. “I’m happy with the way I’ve come through it and I’m happy with the way the club has treated me; they’ve been fantastic. “It’s been a while since I played, too long for my liking, and I’d rather have come back in off some wins, but it’s one of those things. 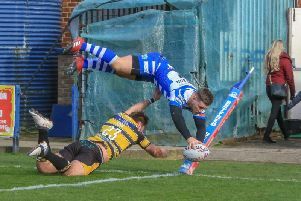 The loss to the Rams was Fax’s sixth straight reverse, easily their worst run under Marshall’s tutelage and one they will attempt to end at Whitehaven’s Recreation Ground on Bank Holiday Monday (2.0). “We have a good group of players, hard working players, and we’ll turn it around,” said Greenwood, who insisted the aim was to rediscover some form in time to go on and win the Championship Shield. “When your luck is out, things go against you sometimes; there were a few things in that Dewsbury game that I don’t think you’d see again in a whole season. “Confidence is definitely down and it’s a strange thing. “No one knows where it comes from and you don’t know where it goes, but we haven’t got it at this moment in time. “We’ll just keep working and move on to the next one now at Whitehaven. “We’ve got four games to find some form before the Shield semi finals and we want to go and win it.